What Is A Sunroom or Solarium? I get this questions quite often, what is a sunroom? As compared to outdoor rooms or enclosed patio designs, it can be hard to tell. In some cases, it’s extra space or an indoor/outdoor area or a way to keep dirt out of the house. Most often it’s the best room in your home! Just imagine your new living area that is rugged to handle the splashes of a hot tub yet refined enough to contain the furniture. You no longer need to choose between inside or outside, you can have both. A sunroom is an opportunity to add usable space to your home and it’s usually an incredibly affordable route to take. If you’ve ever added-on to your home with a new space or patio designs, you know that it can be a very involved process. However, when construction is complete, any addition can make your entire house feel new again. Sunrooms are not quite the same as adding closets or an extra bedroom. They are glass lined spaces that can pull light and happiness right into your home. 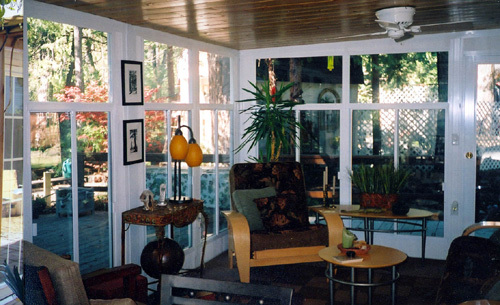 Sunrooms are often the most comfortable and relaxing place to be. I mentioned how incredibly affordable sunrooms can be and depending on your home’s current design, adding a sunroom could cost quite a bit less than you’d think. Do you have a patio behind your house? You may already have the foundation, roof and supports required to enclose the space with one of several patio designs to expand your home. So what is a sunroom to you? Merriam-Webster’s Medical Dictionary, © 2007 Merriam-Webster, Inc. Although both a solarium and a sunroom are intended to let the sun in, a sunroom is intended to be a glass room built for the sake of providing a view while a solarium (often with a glass roof) is built to invite in the sun. Expand on patio designs that work with your home and the price can be very reasonable. So once the question changes from, “what is a sunroom” to “when can I get my sunroom or solarium”, give us a call! Mico Construction Inc. specializes in outdoor rooms, high-end patio designs, garage, and carport additions, as well as general residential upgrades.